The attack, claimed by separatist insurgents from the impoverished southwestern Pakistani province of Baluchistan, killed four people, including two police, but it was far from the most deadly on a particularly violent day across the region. A suicide attacker on a motorbike set off explosives in a crowded festival and market in northwest Pakistanâ€™s Orakzai region, killing at least 25 people at around the same time as the Karachi bloodshed. The blood-letting comes as faint hopes for peace in Afghanistan have been stirred by two meetings between U.S. special envoy Zalmay Khalilzad and the Taliban in Qatar. U.S. President Donald Trump said on Thursday the United States was â€œin very strongâ€ peace negotiations in Afghanistan but he did not know whether they would be successful. 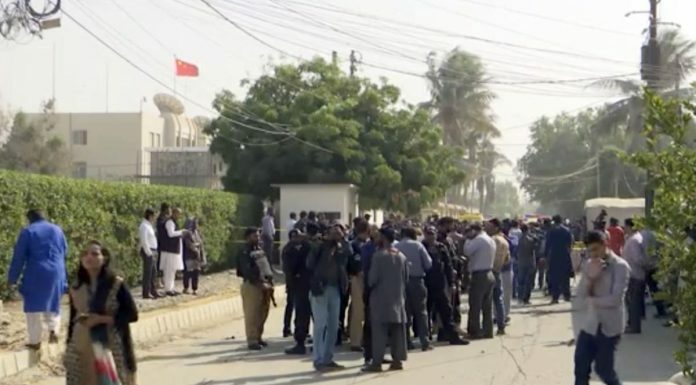 The attack on Chinaâ€™s consulate in Karachi was claimed by the separatist Baloch Liberation Army (BLA) insurgent group that opposes Chinese projects linked to its Belt and Road initiative in resource-rich Baluchistan. Pakistani Prime Minister Imran Khan called it â€œpart of conspiracyâ€ against Pakistani and Chinese economic and strategic cooperation and ordered an inquiry, his office said. â€œThe perpetrators of this heinous attack should be brought to justice expeditiously,â€ Indiaâ€™s foreign ministry said in a statement. As the Karachi attack unfolded, an explosion and gunshots rang out in its affluent Clifton neighborhood and a plume of smoke rose over the area. â€œThey tried to get inside, but the Rangers and police killed one of the terrorists,â€ Shaikh said. â€œChina is exploiting our resources,â€ spokesman Jiand Baloch told Reuters by telephone. China has funded development of a deep-water port at Gwadar in south Baluchistan, and is also investing in other projects on a China Pakistan Economic Corridor. Baluchistan, which is on the borders of Afghanistan and Iran, has rich mineral and natural gas reserves but is Pakistanâ€™s poorest province. Separatists have for decades campaigned against what they see as the unfair exploitation of resources, in particular natural gas and minerals. The Chinese governmentâ€™s top diplomat, Wang Yi, said he was â€œshockedâ€ by the attack and urged Pakistan to prevent any more such incidents. A Chinese foreign ministry spokesman said China would â€œcontinue unswervinglyâ€ to work with Pakistan to develop economic projects. The suicide bomb attack in the Afghan border province of Khost came as people gathered for Friday prayers at the mosque on the army base. The Taliban, who are waging a war to oust the Western-backed Afghan government and expel foreign forces, have launched a series of high-profile attacks against Afghan security forces in recent weeks. The blast in Pakistanâ€™s Orakzai region was also at a Friday festive gathering.